That’s right, Monster Cable, the company well known for its rather expensive audio cables and peripherals has taken the opportunity to delve into the headphone market. The difference with their entry, they are doing it big time. In January of this year the TechwareLabs staff was on hand at the Monster press conference when they announced the Turbines and their partnership with Ludacris to help promote the entry. We later interviewed the head monster and Ludacris to get their thoughts. Now the Turbines are entering a market flooded with products of all ranges, but a closer look at the suggested retail price of $149 to $179 says these headphones are squarely aimed at the medium to high end market. But they are just earplugs you might might be thinking, and at $149 you could well buy a high end product from Bose or Shure. What makes the Turbines different, the answer, a whole new level of listening pleasure. Pretty excited for these. Thinking about upgrading. who put that guy on tv?? 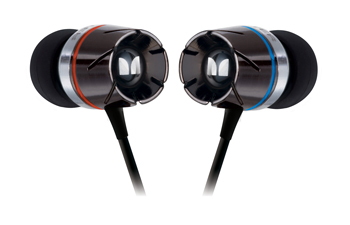 Monster Cables and headphones are generally high quality products I know next to nothing about. These earbuds look amazing and I can’t deny the fact that I have never even tried them and tend to comment without thinking first. They’re just so damn crazy expensive seeing as they are priced lower than competing products. Nothing I enjoy more than editing the idiotic comment of someone who clearly has never even tried the product in question and who is also clearly trying to shamelessly plug their website at the expense of mine with links to theirs. I suggest you take a course in web etiquette 1.0 and then return. It is a shame really as I would have been happy to assist you and your website otherwise.